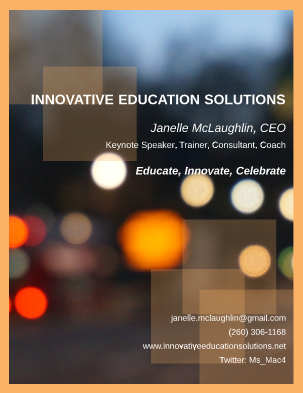 Innovative Education Solutions founded in June 2015, is a multifaceted consulting firm working with teachers, schools, districts, and other businesses in innovative teaching, learning, and leadership best practices. Since its inception, IES has worked in twelve different states, over 25 different school districts and organizations, and two countries. Services range from organizational leadership structures and workflow solutions for all industries to more education-specific services for school systems. All strong foundations are built on authentic relationships. Janelle McLaughlin, CEO and Principal Consultant at IES builds her business on that very principle. By listening to leaders, she will work with them to create a professional learning plan and construct attainable solutions that best meet their needs. See the “Let’s Work Together” page for more detail.